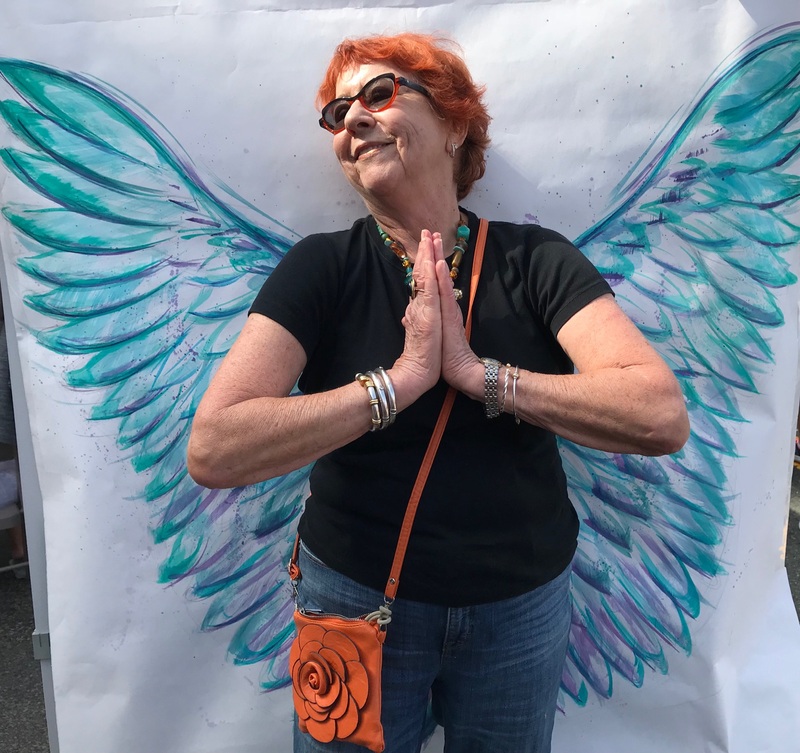 These wings were a buzz item at the Summer 2018 Open Studios of my neighbors and colleagues, Donna and Paul Goes, mentioned previously in these pages. A most creative couple, they taped the wings to a wall and invited visitors to be photographed. Over 100 visitors enjoyed it! (Except me since I was hosting my own Open Studios.) To continue the fun, they brought the wings as well as a surfboard background to Hull’s annual “Endless Summer” Street Fair where Hull Artisrs sponsors a Kids Tent with art projects. I immediately saw this as a Christmas/Hunakah/Holiday greeting! One of my favorite pastimes is to take time to laugh. Me in angel wings was a grand opportunity to do so! May the Holidays and the New Year give you many moments of laughter! Michael Domina is another of Hull’s most creative artists and a close friend. Some time ago he did a contemporary self-portrait and we discussed doing my portrait in that fun disjointed style. Well, when the time in his schedule arrived, so had Max. Quick change of plans. It’s me and my doggie companion on a new road in 2018. And in case if your viewing screen is small, let me tell you it is a very orange work of art. I’m so happy Michael interpreted me so on the mark! Closing this last blog of 2018 by saluting my readers, offering much gratitude for following my meanderings. It gives me great satisfaction to write, to share my craft, and to laugh. Sending special wishes for you to close out this year with a bang and to enjoy 2019!!! Fab pics of a fab woman!!! Both…very cool! Merry Christmas and a Happy New Year! Whelmed by the rolling months, from Tir³ to Dai³! Priscilla (/prɪˈsɪlə/ Greek: Πρίσκιλλα, Priskilla) and Aquila (/ˈækwɪlə/; Greek: Ἀκύλας, Akylas) were a first century Christian missionary married couple described in the New Testament and traditionally listed among the Seventy Disciples. They lived, worked, and traveled with the Apostle Paul, who described them as his “fellow workers in Christ Jesus” (Romans 16:3 NASB). Priscilla and Aquila are described in the New Testament as providing a presence that strengthened the early Christian churches. Paul was generous in his recognition and acknowledgment of his indebtedness to them (Rom. 16:3-4). Together, they are credited with instructing Apollos, a major evangelist of the first century, and “[explaining] to him the way of God more accurately” (Acts 18:26). It is thought by some to be possible, in light of her apparent prominence, that Priscilla held the office of presbyter . She also is thought by some to be the anonymous author of the Epistle to the Hebrews. Aquila was a Jewish tentmaker. He and his wife Prisca or Priscilla were forced to leave Rome when Emperor Claudius forbade Jews to live there. They went to Corinth, where St. Paul lived with them during his stay there and may have converted them to Christianity. They accompanied Paul to Ephesus and remained there; Paul stayed with them on his third missionary journey. They then returned to Rome, where there house was also used as a church and then went back to Ephesus. They suffered martyrdom in Asia Minor, according to the Roman Martyrology but a tradition has them martyred in Rome. There are two St Priscillas! The Aforementioned wife of a Tent Maker and the other the wife of a prominent Roman, this Priscilla opened her home to Christians and in particular Peter, and there are tales of her daring as she helped to hide other Christians from the wrath of Roman officials bent on destroying this new religion. The graveyard/catacombs beneath her home appear in legend not only as a burial place but as a safe place, a hiding place, an underground railroad in many tales. Merry Christmas to you as well Priscilla. I wish you were still next door so we could have a toddy together. Love toe pic of you and Max and the angel wings are a hoot! Oh Priscilla only you can make a holiday card that is both naughty and nice! This is such fun and you look happy, love that painting of you and Max. We are having the Pescatores over tonight for dinner and will see the Marrs tomorrow. Hadn’t planned on the Marrs but saw them last week and learned Kate and Lucy were coming for Christmas so invited them over for a glass of wine. So the gossip on the ranch is that Camille Anderson had a face lift, and a very good one, thought of asking who she used but that seems sort of rude. Don’t know if you knew Patti Ann Morgridge died a few months ago and the house will be on the market after the new year. Lots of new faces and names and realize as we drive around how few people we know, our new year resolution is to be more social before we become hermits. We are happy and well and looking forward to a new year and new projects. Janie is doing great and loves her new house and is hosting Walt’s family for Christmas. She has been sending me pictures of her redecorating and just got an email that she painted two walls of the office/studio ‘Las Vegas’ red, can’t wait to see those pictures. Sending you big hugs and wishes for a good holiday and new year.